Quilt Dad: Quilt-a-Long | Final Block Done! Quilt-a-Long | Final Block Done! I took a break from it for a little while, but I finally made my 25th and final block for Amanda Jean's quilt-a-long. Does it look familiar? : ) This is the only block for which I didn't use one of Amanda Jean's tutorials. I've been on the lookout for a block pattern that I liked enough for my final block, and as soon as I received the latest BOM pattern, I knew I had found it. And, as always, I've put together a mosaic of what the final quilt might look like. This is just a random arrangement so it's not necessarily the layout I will choose, but I think it gives a good idea nontheless. I just bought some more white fabric for sashing strips between the blocks, and I think I'm just going to stick with small squares of the various different fabrics as cornerstones ... unless anyone has any better ideas ... ... ...? I'm really excited to start pulling this one together. Think I can have it done by Christmas?? Fantastic blocks! If you try hard you can finish by the holidays, but sometimes life gets in the way. How did you make the mosaic and post to the blog? Is that Flickr too? 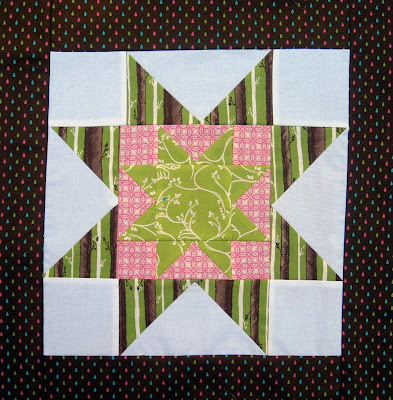 Love the fabric choice in your last block - is that the quilt along and the star quilt along together? Wow! You have been really busy. This is going to be so beautiful and I think you can have it done by Christmas. The sashing and cornerstones will go quick, right? I love the use of the striped fabric and the way all the strips go in the same direction. I love the blue/brown star. I always thought that it was a hard pattern until I looked at it one night and figured it out - it is all half-square triangles. 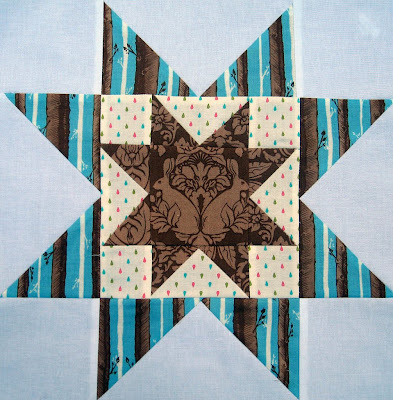 I love the magic of piecing quilt squares. Oh, how I love Full Moon Forest! Wow - great work! You have a delicious sense of color, and this is going to be a great quilt. Oooh the brown/blue combo is delicious! Nicely done John! That quilt is too charming, I love it! you can do it! it's always good to have a deadline. John, Thanks for your recent visit to my new blog. 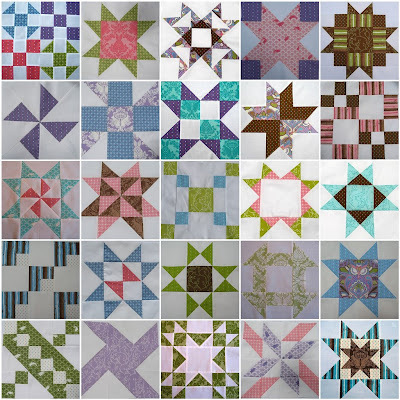 I have enjoyed looking over your blog, especially your most recent posting of the quilt squares. Very nice. Congrats on finishing! I love those Full Moon Forest fabrics. Oh John - they're all amazing! Really - spectacular. You have a great eye for color! Congrats! Beautiful as always. Can't wait to see it all put together. I like the blue and brown block too! But I love blue and brown,and have so much blue and brown stash and blue and brown quilts! (And it's pretty much the only colors i wear!) easy to pack that way! sure you can get it done by xmas! good luck! I think brown and white in the sashing would look good - if you are asking. your blocks are so fantastic! I am excited to see this one finished.